I recently spent a week in Puerto Rico for the celebration of the San Juan Rotary Club’s 100th anniversary. Dignitaries from around the US were on hand for the big gala event, but they also spent time traveling around Puerto Rico to learn more about the Island and how Rotary International has mobilized to help the victims of Hurricane Maria (September 2017). I tagged along and accompanied Gerry to Loiza Aldea, a storied community on the north coast, east of San Juan. 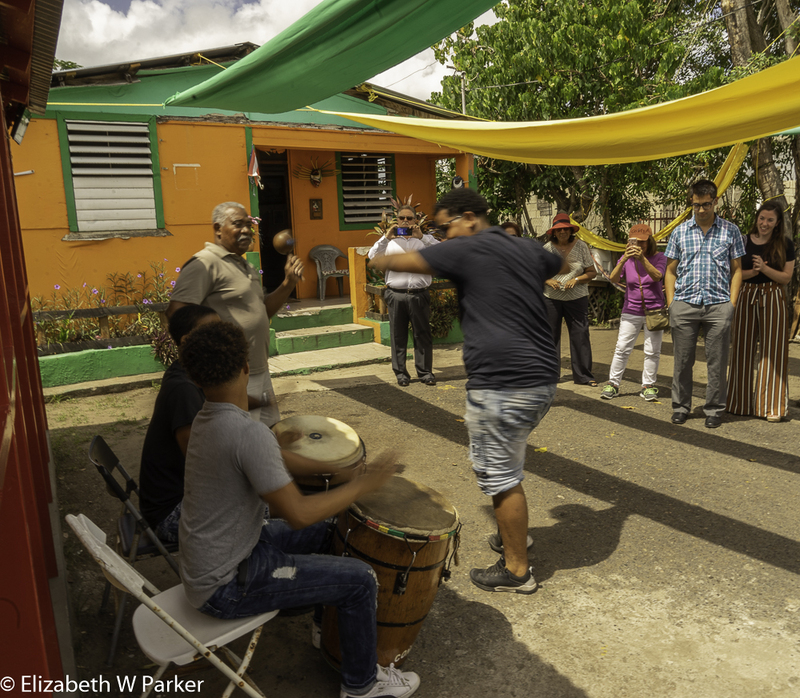 There, at the home and workshop of the Ayala family, the Rotarian guests were treated to the story of the town and a demonstration of the typical drumming for bomba, a call-and-response type dance that is done completely with gestures – no spoken words. 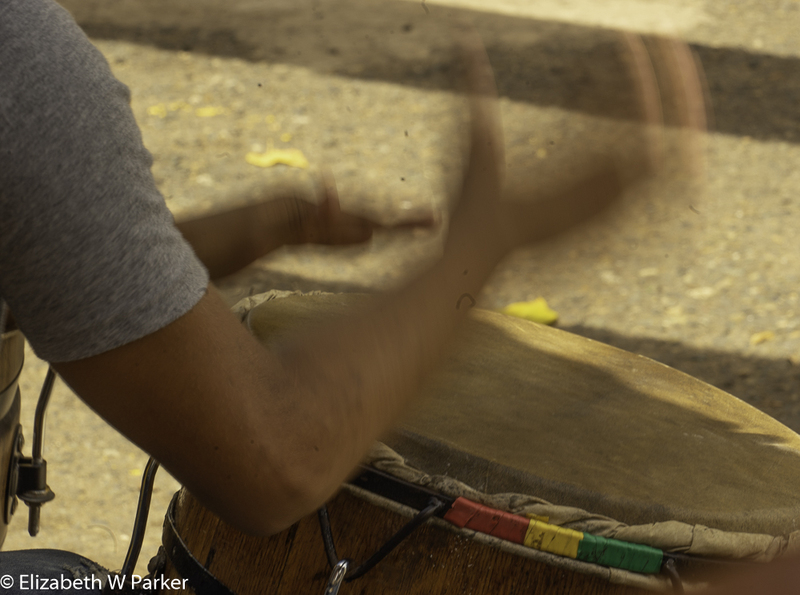 Bomba drummer’s hands fly on the cuero. 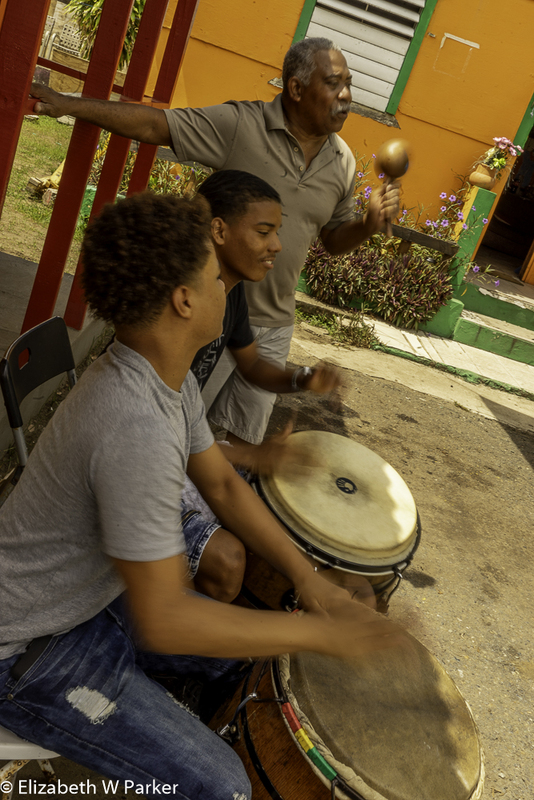 The Ayala family is highly renown in Puerto Rico for their work in maintaining the culture of the Loiza vejigantes. Their little store is a perfect place to purchase the coconut vejigante masks that are typical of this community. And the patio next to the store was a perfect place to entertain the visiting and local Rotarians. The store, closed because of damage sustained during the hurricanes of last year, has recently reopened. Dancing to the drums – bomba! Our visit was just after the celebrations of the Festival of Santiago Apostle (July 25th) … This year it was a celebration with a “We’re Still Here!” flavor. The origins and the customs are interesting, though and I found this website that gives some excellent background. One aspect of out trip seemed to repeat – the significance of three. 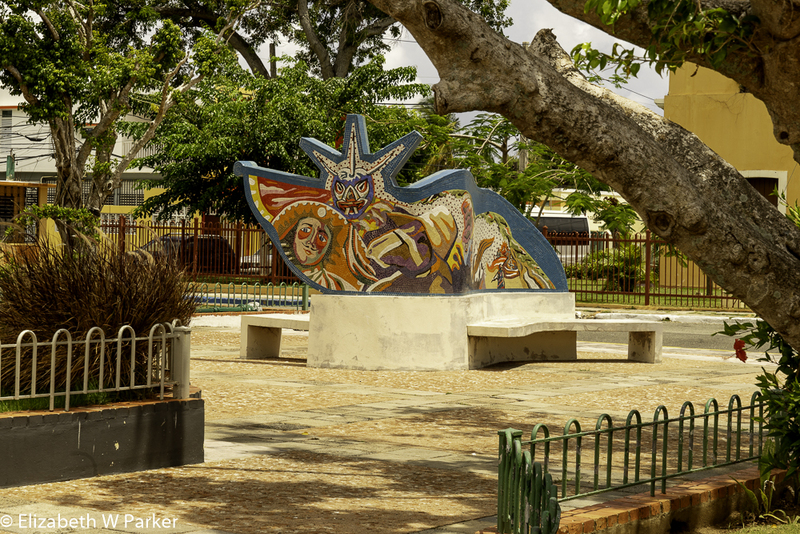 Three parts to the Loiza flag, three statues of Saint James and so on. We heard far more than three explanations for this! You’ll have to go and find out for yourself which are the most meaningful. Have fun!